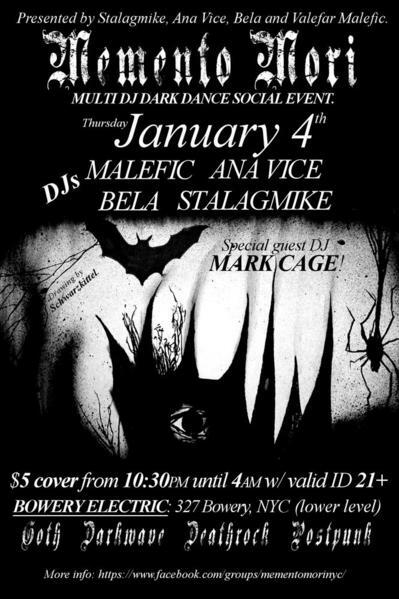 Resident DJs Ana Vice, Malefic, Bela (Alejandro), and Stalagmike with special guest DJ Mark Cage (Procession, Svmmon) spinning a variety of outstanding classics, obscurities and new developments!! Jocelyn Shipley of necronomicharm will be vending her Occult and Gothic inspired jewelry! $5 cover from 10:30PM until 4AM. 21+ and please bring valid ID. Memento Mori (lower level) joins Shattered (upper level) at Bowery Electric for a special Winter Darkness Event! Invite design by Ana Vice and drawing by Schwarzkittel.